Picturesque Island Lake Conservation Area is located in the rolling hills of Dufferin County in the Towns of Orangeville and Mono, and provides four seasons of recreation. It’s 332 hectares of lake, wetland, forest and meadows play an important ecological role in protecting the headwaters of the Credit and Nottawasaga Rivers . Part of a six kilometer long series of vibrant wetlands and a source of upwellings of water from underground, this area feeds cool, clean, naturally-filtered water to these regionally important river systems. Island Lake ‘s varied landscapes lend themselves to interesting and educational hikes and outings. The lake is rich in life with healthy fish and wildlife populations, and abundant underwater plants. On shore, deer, red fox, raccoon, porcupines and even flying squirrels make their homes. Osprey, great blue herons, mallards and many other bird species are seen at Island Lake throughout the summer, as are painted turtles and leopard frogs. In spring and fall, migratory birds pause briefly, taking advantage of the diverse habitats and provide an opportunity for birdwatchers to enjoy. Water dominates ILCA in the form of bogs, marshes, rivers, creeks and lake itself. These wetlands make up part of the provincially significant Orangeville Wetland Complex and act like a filter, purifying water and soaking up nutrients. If you have any questions or concerns regarding this matter, please contact 1-800-367-0890, recreation@creditvalleyca.ca. Cleared for farming in the 1800s, the forested hedgerows, old fields, plantations and a remnant maple-beech forest are reminders of this past. In 1967, the local landscape changed dramatically with the construction of two dams. The dams flooded a large cedar swamp, deciduous thicket and the small lake creating a 182 ha reservoir, first known as the Orangeville Reservoir, but now named Island Lake, not for the Islands the flooding created but for an original settler to the area. Located at the west end of the lake, the dams control water flow into the Credit River . Controlling the amount of water flowing into the river improves the water quality thereby enhancing the health and beauty of the Upper Credit watershed. The Conservation Area opened to the public in 1970 after the completion of these dams. In 2001, the first 2.5 kilometers of the Vicki Barron Lakeside Trail opened with long-term plans to circle Island Lake and link to local trails in Orangeville, Caledon and Mono. It was named to recognize the outstanding contributions made by Credit Valley Conservation’s retired General Manager. The trail is designed to be all accessible and offer opportunities for hiking, walking, cross-country skiing, bicycling and nature study. The Friends of Island Lake (FOIL) was established in 2005 to support fundraising efforts for the additional sections of the perimeter trail. FOIL raised more than $1.8 million in donations (cash and in-kind labour and materials), and contributed more than 10,000 hours each year to finish the 8.2 kilometre trail in 2015. This four season trail is appropriate for all trail users; its wide base made up of packed gravel screenings make it suitable for bicycles, wheelchairs and strollers. No motorized vehicles please. The Maple Sugar Bush Trail takes you through a long standing Maple-Beech forest, where maple syrup production is still practiced. Enjoy the cool breeze under the shade of the tree canopy as you hike this trail. Be prepared for a more rugged hike as the forest floor is littered with rocks and roots and not maintained in the winter. Come explore during our annual Maple Syrup Festival. 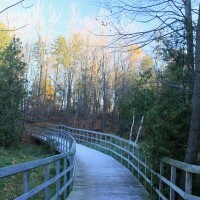 The Memorial Forest Trail at Island Lake Conservation Area guides you through the Dods and McNair Memorial Forest, named for the local Dods and McNair Funeral Home in Orangeville. The path through this former meadowland consists of gently rolling mowed grass hills and provides a leisurely walk through this section of the Conservation Area. You will also find portions of a nut plantation here including chestnut and black walnut. In winter, these trails are excellent for cross-country skiing. An interesting feature along this path is a living memorial wall built in 2011 by dry stone waller Eric Landman. Mr. Landman built the wall in memory of his late wife, Kerry. In a personal letter to CVC, he explains why he chose to build this wall and its significance for his family and visitors to the Memorial Forest. The Dods & McNair Memorial Forest was established to assist those in grief and as recognition of the severe depletion of our forests. Beautiful as trees are, they provide much more – shade, wind protection, erosion control, and shelter for wildlife. A Memorial Tree may be planted in memory of a loved one through this program, regardless of the duration of time since the death, where the death occurred or where a service was held. To dedicate a tree in memory of a loved one, please call Dods & McNair Funeral Home at 519.941.1392. Memorial benches are also available at Island Lake Conservation Area. For more information on the benches please contact Sandy Camplin at 416-505-9163. To find other ways to contribute to conservation, please the Credit Valley Conservation Foundation website. The Friends of Island Lake (FOIL) was established in 2005 as a fundraising committee under the Credit Valley Conservation Foundation. The Friends were formed to enhance community involvement and awareness of the need to expand the current trail system at Island Lake Conservation Area. FOIL members are community members dedicated to ensuring the community and its visitors benefit from quality educational, interpretive and recreational opportunities at Island Lake Conservation Area. To learn more, please visit the Credit Valley Conservation Foundation website. In recent years, a management plan has been developed for Island Lake . This plan creates a vision to guide the conservation area’s development, and combines the need for protecting this valuable natural resource while at the same time providing pleasant recreational opportunities for local residents and tourists. Truly, Island Lake provides a balance between protection and recreation.